Song HR, Sinha S, Song SH, Suh SW. A Case of Metatropic Dysplasia: Operative Treatment of Severe Kyphoscoliosis and Limb Deformities. Oman Med J 2013 Nov; 28(6):445-447. Metatropic dysplasia (metatropic–changing hypertrophic achondroplasia) was described in 1966 by Maroteaux et al. and presents with characteristic clinical and diagnostic radiographic findings.1 At birth, children with metatropic dysplasia appear to have a long trunk and short limbs. The relentlessly progressive kyphoscoliosis that occurs during infancy causes an apparent equalization of trunk and limbs, hence the name "metatropic", derived from the Greek word metatropos, meaning "to change." Clinically, most children with metatropic dysplasia are short statured with rhizomelia, prominent stiff joints, pectus carinatum, and severe kyphoscoliosis. It comprises at least three genetic entities: (1) a nonlethal type with autosomal recessive transmission, (2) a nonlethal dominant type, and (3) a lethal type with death before or shortly after birth and possibly autosomal recessive inheritance.2 In addition, the observation of an overlap between the autosomal recessive non-lethal form and the non-lethal autosomal dominant form, the rarity of sibship recurrences and the observation of vertical transmissions of metatropic dysplasia in the literature argue in favor of an autosomal dominant mode of inheritance. Recurrence in sibs is thought to be due to gonadal mosaicism.3 Kyphoscoliosis is usually rapidly progressive after the first 6 months of age leading to alteration of pulmonary function, morbidity and reduced life expectancy. With advancing age, osteoarthritic changes are superimposed on the regressive metaphyseal changes. A 6-year-old Korean male presented with progressive kyphoscoliosis and short stature in the outpatient department (Fig. 1). The first child of an unrelated healthy Korean parents, his antenatal diagnosis could not be obtained. At birth, he was 56 cm (>97 centile) and was noted to have severe kyphoscoliosis, relatively short extremities, and narrow chest with elongated face. Radiographic skeletal survey revealed characteristic vertebra plana (dense wafer thin), dumbbell shaped long bones, kyphosis, halberd shaped pelvis, squared calcaneus and coccygeal appendage consistent with the diagnosis of metatropic dysplasia. Figure 1: Clinical photograph of the patient presented in OPD showing thoracic kyphosis. The overall height of the child was 97.5 cm at the age of six years. There was a discrepancy of 4 cm in tibia and 1 cm in femur, with overall limb length discrepancy of 5 cm. 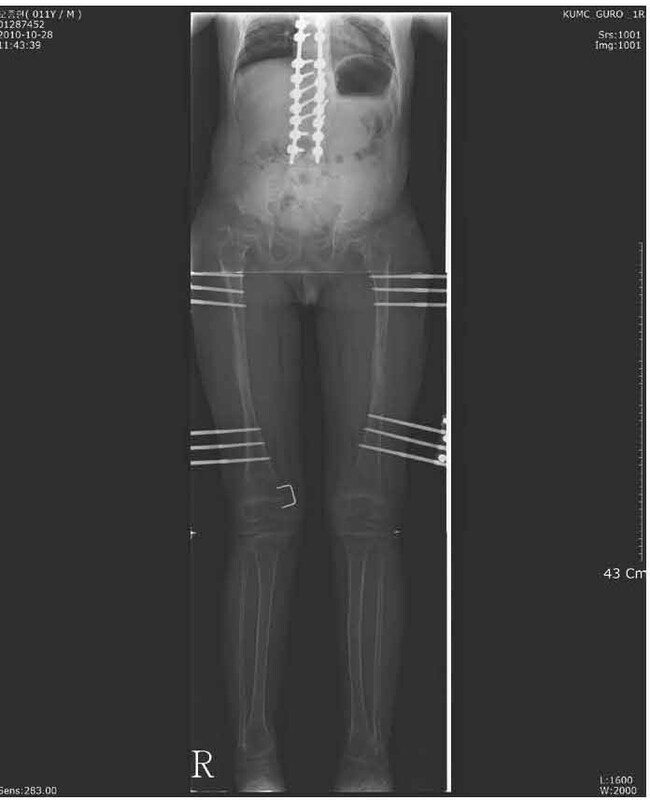 The child had a left-sided flexible kyphoscoliosis with Cobb’s angle of 56 degrees on standing X-rays (Fig. 2). After careful preoperative pulmonary function evaluation, corrective spine surgery with posterior fusion with pedicle screw instrumentation from T6 to L4 was done after one year (Fig. 3). Bifocal tibial osteotomy and gradual distraction with Ilizarov ring fixator was done later to improve the short stature and limb length discrepancy as calculated by Green-Anderson chart. The ring fixator was kept for 14 months. Figure 2: X-ray revealed left sided scoliosis (Cobb’s angle 56 degrees) with abnormalities in pelvis and proximal femur metaphysics. 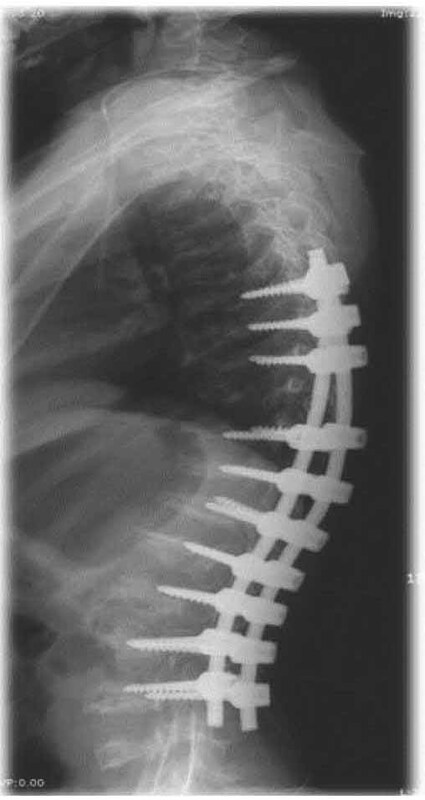 Figure 3: One year post-op radiograph after corrective spinal surgery and posterior fusion. At 4 years follow-up of spine surgery, i.e., at 11 years of age, there was no progression of kyphoscoliosis in spine with reasonable pulmonary function and maintained spinal correction. 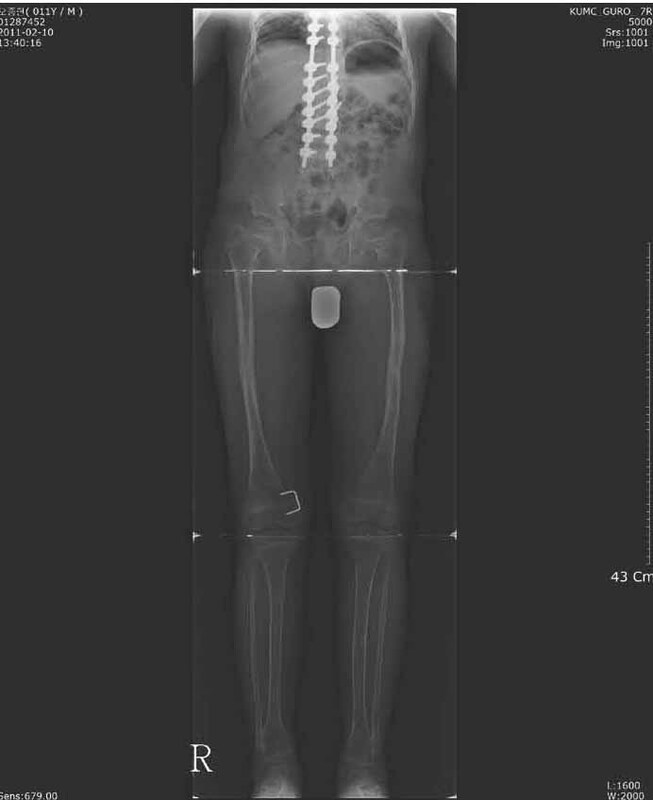 As the child attained the height of 122 cm, there was a limb length discrepancy of 2 cm along with genu valgum of about 10 degrees with medial axis deviation of 33 degrees on right side. This was managed with monofocal femoral osteotomy with gradual lengthening and hemiepiphysiodesis of right proximal tibia (Fig. 4). At final follow-up, the child showed good overall functional improvement orthopedically and socially (Fig. 5). Informed consent was taken from the patient’s parents after explaining the rarity of the disease for using this information for the purpose of publication. Figure 4: Right-sided medial hemiepiphysiodesis with bilateral femoral distraction for correction of short stature. 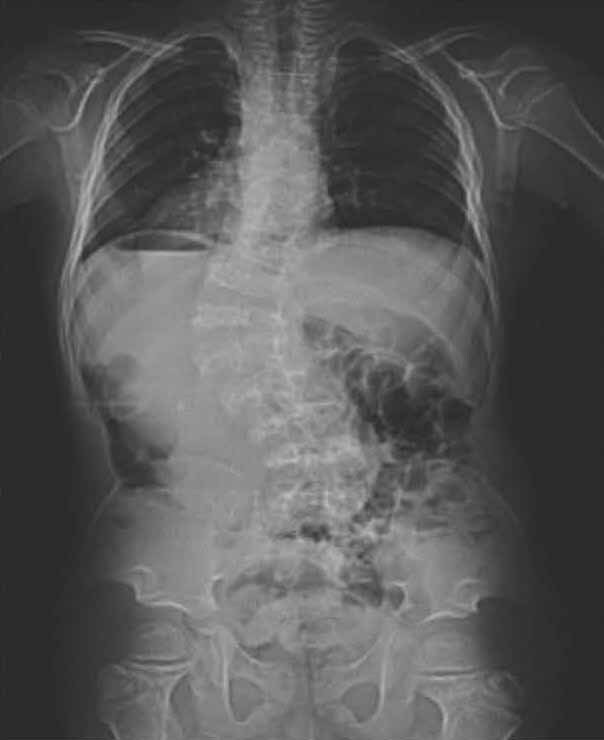 Figure 5: Six-year final follow-up with corrected deformities of spine and joints. In the natural course of the disease, the average adult height reaches up to 120 cm. Intellectual development is normal.4 The proximal end of femur is club-shaped and the lesser trochanter is prominent and down facing. Dens hypoplasia with C1/C2 instability is a feature in severe case. New radiological features, including precocious calcification of hyoid and cricoid cartilage, irregular and squared-off calcaneal bones and severe hypoplasia of the anterior portion of first cervical vertebra have recently been reported.3 Narrowing of the cervical and thoracic spinal canal may be present, making the corrective spinal surgery more challenging. The differential diagnosis of such presentation includes other platyspondylic spondyloepimetadysplasias (SMD), especially SMD-Kozlowski and Morquio’s disease (mucopolysaccheroidosis IV). However, none of them show such marked disproportion between the long trunk and short extremities. The radiographic pattern of the spinal, metaphyseal and pelvic changes is unique. In contrast, our patient showed marked improvement in thoraco-lumbar kyphoscoliosis following corrective spine surgery (multifocal osteotomies and posterior stabilization with fusion) over a period of 6 years as a result of addressing the case early during the growth period of the spine. Limb length discrepancy and deformity was managed with timely intervention and hemiepiphysiodesis. If corrective surgery is performed at an appropriate time after careful patient selection and preoperative evaluation, especially of the pulmonary function, the progression of deformity can be halted and the patient can be encouraged to a live normal life. Surgery for short stature is to be decided on per case basis, according to the severity of deformities which are progressive in due course of time. Understanding the clinical spectrum of metatropic dysplasia, careful patient selection and appropriate intervention has great potential for functional improvement and hence, leading an independent social life for these challenging cases. The authors report no conflict of interest and no funding was received for this work. 1. Maroteaux P, Spranger JW, Wiedemann HR. [Metatrophic dwarfism]. Arch Kinderheilkd 1966 Feb;173(3):211-226. 2. Beck M, Roubicek M, Rogers JG, Naumoff P, Spranger J. Heterogeneity of metatropic dysplasia. Eur J Pediatr 1983 Jun-Jul;140(3):231-237. 3. Geneviève D, Le Merrer M, Feingold J, Munnich A, Maroteaux P, Cormier-Daire V. Revisiting metatropic dysplasia: presentation of a series of 19 novel patients and review of the literature. Am J Med Genet A 2008 Apr;146A(8):992-996. 4. Kannu P, Aftimos S, Mayne V, Donnan L, Savarirayan R. Metatropic dysplasia: clinical and radiographic findings in 11 patients demonstrating long-term natural history. Am J Med Genet A 2007 Nov;143A(21):2512-2522. 5. Krakow D, Vriens J, Camacho N, Luong P, Deixler H, Funari TL, et al. Mutations in the gene encoding the calcium-permeable ion channel TRPV4 produce spondylometaphyseal dysplasia, Kozlowski type and metatropic dysplasia. Am J Hum Genet 2009 Mar;84(3):307-315. 6. Naveen NS, Murlimanju BV, Kumar V, Pulakunta T, Jeeyar H, Jeeyar H, et al; Jeeyar H. Thanatophoric dysplasia: a rare entity. Oman Med J 2011 May;26(3):196-197. 7. Boden SD, Kaplan FS, Fallon MD, Ruddy R, Belik J, Anday E, et al. Metatropic dwarfism. Uncoupling of endochondral and perichondral growth. J Bone Joint Surg Am 1987 Feb;69(2):174-184. 8. Akhter S, Rahman S, Momen M, Karim M, Kawser C. Metatropic dysplasia in children. Mymensingh Med J 2008 Jan;17(1):93-97. 9. Wada A, Fujii T, Takamura K, Yanagida H, Urano N, Baba M. Operative treatment of bilateral hip dislocations in a child with metatropic dysplasia. J Pediatr Orthop B 2007 Mar;16(2):94-97. 10. Leet AI, Sampath JS, Scott CI Jr, MacKenzie WG. Cervical spinal stenosis in metatropic dysplasia. J Pediatr Orthop 2006 May-Jun;26(3):347-352.